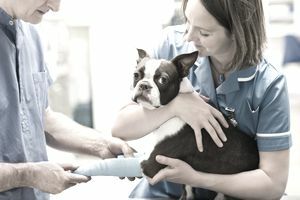 Mobile veterinary clinics have become increasingly popular due to strong demand from pet owners seeking the convenience of at-home animal services. Additionally, veterinarians are finding that this type of veterinary treatment center is much more affordable to open and operate than a stationary clinic. An article in Veterinary Practice News found that the cost of starting a stationary small animal clinic (including most standard equipment) was approximately $1,000,000. A mobile clinic’s startup cost came in at a much more affordable $250,000. Mobile practitioners must, of course, be licensed veterinarians in the state where they practice medicine. The regulations governing the operation of mobile veterinary clinics vary widely from one state to the next. Specific state rules and regulations can be researched on the American Association of Mobile Veterinary Practitioners website. Be sure to obtain all necessary insurance, licenses, permits, or other official paperwork before operating a mobile clinic. Mobile Veterinary clinics utilize a motor vehicle equipped with special medical and surgical equipment to make house or farm calls. A variety of manufacturers make 18 to 30-foot vehicles (vans or trailers) that can be specially equipped for use as veterinary mobile units. Cost varies widely based on the specific equipment that is added, but as mentioned previously the total cost of vehicle and equipment averages about $250,000. Most mobile vets employ a veterinary technician to travel with them. The vet tech can provide assistance with medical procedures, answer client calls, and schedule appointments. You should be sure to find someone that is reliable, professional, and comfortable working in the mobile environment. The next step is to define a specific area within which you will travel to provide veterinary services. You may offer services to an entire town, or choose to focus on a certain portion of a large city or metropolitan area. Some vets rotate their mobile appointments so that they can conveniently service different areas without long commutes during the workday. Mobile vets may benefit from planning visits to farms, community centers, apartment complexes, animal shelters, office complexes so that they can service multiple clients in a single location. This option will save time and minimize travel costs. Many states require mobile practitioners to coordinate with a local stationary clinic so that animals requiring emergency care, hospitalization, or surgery can be referred when such services are deemed necessary. Your mobile clinic may also receive reciprocal referrals from the stationary clinic, as they may have clients that are unable to travel easily, have a large number of animals requiring on-site care, or simply desire the convenience of at-home service. Most mobile veterinarians charge a house call fee on top of the normal costs of veterinary care, which is typically $40 to $50. The vet adds normal exam and treatment fees to this amount. The mobile veterinary vehicle itself is the best form of advertising, as it is basically a billboard for your services as you drive through your local route. The contact information and logos should be clearly visible on both sides of the vehicle. Mobile clinics can also benefit from having a website, a phone book ad, social media pages, and media coverage in local publications. It is also a good idea to leave flyers or business cards at dog parks, pet stores, and other areas where animal owners tend to congregate. Mobile vets have the option of joining the American Association of Mobile Veterinary Practitioners (AAMVP), which offers a searchable “Find a Mobile Practitioner” database to the public. This is a great way to advertise, and also serves as a professional networking resource. Another great way to promote your services is by networking with other providers of at-home animal services such as mobile dog groomers, pet sitters, and pooper scooper businesses. Reciprocal referrals can be a great way to grow business for all parties concerned, as clients who already use such services are very likely to consider additional options.